For students in Serbia the new school year started on the first of September. Among them over 150¹ school-aged Asylum seekers and people on the move who are currently accommodated in camps in Serbia are enrolled for the next term. In around 50 regular elementary schools all over Serbia they participate in classes since last week together with the local children. According to UNHCR almost half of the 4000 people registered in Serbia’s asylum and temporary centers* are children, 1500 of them in school-age. Last year just a couple of the kids attended schools, this year much more, but out the of for this year planned 800 school enrollments only 150 children are actually going to school so far. The chosen schools are located close to the camps. SCRM (“Serbian Commissioner for refugees and migrants”) is responsible for the transportation between the centers and the different schools, providing lunch boxes and supported by some NGO’s equipment and materials which the students need. As it is all regular local schools and therefore the lessons just held in Serbian, the attempt is to give a special training to English teachers who should join the classes as interpretors and translate Serbian to English for those who do not speak Serbian. However also many of these kids do not speak English as well and there is anyway a lack of English teachers and not at all enough translators to cover all the lessons. Pupils report that they are sent to the classes without interpretor no matter if they understand or speak Serbian which is OK in subjects as maths, art or foreign languages but difficult in many other lessons. Some NGO’s and volunteers offer extra Serbian language classes but as they are only active in Belgrade and a very few camps just a minority of the students has the chance to make use of that. Not only the limited number of enrolled students and the language barriers already became apparent. The public reaction on locals and migrants joining the same classes is alarming! Visnjicevo is in West-Serbia close to the transit center in Adasevci* where after the camp in Krnjaca* the biggest number of school-aged children are staying. Also in other schools for example in Belgrade parents were raising concerns such as worries that teachers might focus more migrant kids then other students due to language problems and therefore neglect the local children. 4500 Asylum seekers and people on the move are currently staying in Serbia. Since last summer this number has not been that small. After the quantity rose up to 8000 in winter 2016 it is constantly decreasing since March. Volunteers working with Serbian NGO’s report that their organizations get pressured by representatives to spread the news of Vucic’s offer and publish pictures of the meeting on their social media platforms and web sides if “they want to stay in good terms with [the Serbian authorities]”². After NGO’s felt pressured to delimit their humanitarian aid to people in the move in Belgrade city center after an open letter by the Serbian government in November, the same ones are now used to spread political propaganda³ for the autocratic president who is besides all his other blemish one of the political forces responsible for general and concrete iniquitous misdoings in Serbia’s migration policy. Vucic who by law also has not the authority to grant international protection, Asylum or citizenship to anyone takes advantage by the wide media attention and uses people who are directly affected by his regressive policy for advertising himself as a philanthropist, putting his person and politics in a positive light also in front of the international community. The offering was a symbolic act without consequences first of all complimenting the president. 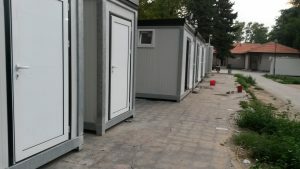 In the fringe area of Sombor, a charming Serbian town with around 60.000 habitants, less than 20km to the Croatian and less then 40km distance to the Hungarian border, a temporary refugee camp (Transit Center*) opened in the beginning of November 2016 as one of nine temporary shelters built up from autumn 2016 until spring 2017 in order to accommodate the increasing number of refugees in Serbia at this time. Since several weeks people staying in Sombor TC feel more and more stress triggered by enforced relocations to the closed camp Presovo, the presence of fascists & racist violations from locals and pressure from the camp’s authority. From the beginning the Sombor Transit center was one of Serbia’s smallest camps. Mainly families were and are living there, usually between 80 and 150 people all together. It is located ca. 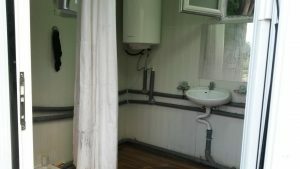 5km from Sombor’s city center, in a pretty outside district, surrounded by wood and fields and like all camps managed by the “Serbian Commissioner for refugees and migrants” (SCRM). The whole camp area is surrounded by a shoulder high fence with two gates from which one is usually closed and the other one in front on the administration house in the Commissariat’s field of view but open during daytime. Only residents and people who are working inside the camp are allowed to enter. Officially the camp is currently not receiving new people. But although the Commissariat refuses to register more refugees or to distribute more meal vouchers they do not make any effort to keep an overview who is staying in the camp. As there are several big well-known wholes in the fence and the commissariat is not checking people’s registration cards lots of people without registration are entering, staying and leaving the camp without any problems. As the capacity of the camp is still far from being reached, as inhabitants report, people suppose that the camp’s leadership does not cancel old registrations which means that quite a lot of people are registered in Sombor who are not staying there (anymore) and consequently that the official number of residents is much higher then the actual which might be the reason why new registrations are not possible anymore. Generally people describe the camp’s management as corrupt and unfriendly. Showing no interest for the people’s needs they are sometimes threatening for example with deportations to the RC in Presovo in order to create pressure and obedience. 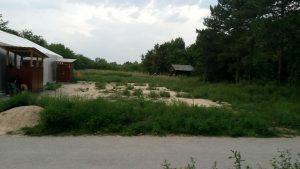 As this blog already reported about current enforced relocations to the closed camp in Presovo (click here), also residents of Sombor TC are affected by that. People staying in the camp report about policemen irregularly coming in the very early morning hours (2-5pm) inside the camp and forcing some single men sleeping in the tent into buses that drive them to Presovo: The police is surrounding the tent, blocking the entrances to prevent escape and beat those who try to resist. Some people got already deported several times, as some succeed to come back from Presovo to Sombor, but again were relocated, some of them even two or three times. After a couple of this incidents people are very afraid and leave the camp over night. 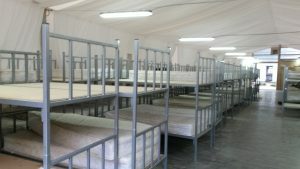 Only the families in the shelter house and some single men who are badly injured (Hungarian border police violence) or seriously sick are still sleeping in the white tent. Also sleeping in the surroundings of the center is not safe as police is also targeting for people in the jungle and fields in this area. It is assumed that SCRM wants to transform the center to a shelter just for families and unaccompanied minors via that relocations. Another development stoking fears and insecurity is the increasing presence of racist Serbians in Sombor. A report about a racist attack by locals on a migrant describes the current xenophobic atmosphere and incident recently going on in Sombor (click here). Generally people are threatened not to leave the camp after 7pm by fascists “patrolling” as an informal “vigilante group” the street leading to the city, taunting, forcing people to go “back to the camp”, offend people with insulting prejudice and allegations, pushing and physically badgering. Also physical or verbal attacks during nighttime on people sleeping outside of the camp is increasing and getting more and more brutal. About those incidents the Center’s leadership does not feel in charge as well, even does not interfere when they witness violent attacks and accuses the migrants that they should not leave the camp especially during the night. Also the police sends people away who try to report an offense about violations just blaming that migrants should stay inside the TC. This atmosphere also creates an even bigger isolation between migrants and locals as people living in the camp get unconfident about going to the city center at all or getting in contact with Serbians. A racist act of assault took place last evening (Wednesday, 02.08.2017) against a refugee in Sombor. A young men got badly injured by a group of young local men armed with knifes and a metal punch. I.a. he got hit with a knife close to his eye. At the moment he is in ambulant treatment. Doctors affirm that he will convalesce. The incident happened when around seven drunken Serbians went on the Sombor Transit center‘s ground (camp’s area is surrounded by a knee-high fence) where outside of the camp’s building at the edge of the terrain some single men are sleeping in big tents. The camp’s director answered the people who announced the incident to the center’s administration that he is responsible for accommodation and food in the camp but nothing else. There were already some racist incidents happening to people sleeping outside of the camp‘s terrain like damage of tents, theft of valuables or other assaults by apparently mostly drunken locals. People guess that this are impulsive actions done by people coming out of a pub just a few meters away from the camp. Still this especially cruel and violent physical attack is a new level of force against migrants and xenophobia in Serbia. Besides since several weeks migrants staying in Sombor detail about a small mass of Serbian people protesting every evening close to the TC against the camp and migrants in Serbia generally. Usually accompanied by police, sometimes by journalists they show banners and do not let people supposed being migrants pass the street towards the city center by verbal abusing and aggressive gesture and even pushing. Many people who stay in Sombor claim that they do not feel safe anymore. The Transit center (TC) in Sombor (border triangle between Serbia, Croatia and Hungary) was opened in November 2016, according to UNHCR currently accommodates around 150 people, mostly families, and is located outside of the city center in between of fields and wood. There are also quite of lot of people staying without registration outside in the fields in the surrounding mostly because they are afraid of transfers to the camp in Presovo. As it has been already stated, violence, repression and persecution has been growing since the squatted barracks got evicted and demolished on May 11th. Before the elections the serbian police was more reserved but now is using violence openly. In the last two weeks there has been three physically violent police operations, forcing people to be taken to the infamous Preševo closed “camp” near Macedonia. Although is it presented as a reception center, the unspoken reality is that of a detention camp. The approx. 1000 people imprisoned there are not allowed to go in or out, except for a very restricted special permission, and the only way to leave the camp is to be pushed-back illegaly to Macedonia, which happens regularly. The first of these operations took place inside the official refugee camp in Obrenovac, near Belgrade. The police came to the camp at 5 o‘clock in the morning on June 10th and forced 103 random people inside waiting buses. Those who were resisting got violently beaten up and abused verbally. The approximately 50 policemen neither told anyone where they would be brought, although they were constantly asked to do so. People didn’t have time to take their personal belongings with them, not even their phones. Among them were families and minors who got separated. On June 16th at 4 am, there was another police operation in Sombor Camp, near the Croatian and Hungarian border. This time all 148 single men were rounded up in a similar violent fashion and brought to Preševo as well. On June 22nd also at 4am, the police literally hunt down approximately 100 people staying in the area of the former refugee camp near the Croatian border in the city of Šid. People were beaten and forced at gun point to leave their belongings and get into buses and were brought to the prison camp of Preševo. Acting as spokesperson, being part of the decision making and putting himself in the spotlight is the minister of labour, employment, veteran and social policy, Aleksandar Vulin. He is openly using racist rhetoric as he referred to the operation in Šid as “cleansing”1 the area and justifying the actions with the usual lies of a safer environment for both residents and refugees by locking them up in, as he cynically put it: “in camps of the highest international standards”. The pretending of the serbian authorities that these violent operations were conducted “in a human way”, saving migrants from the smugglers, locals from migrants, and the rest of europe from the “spread of the refugee crisis” is totally disgusting. As long as this racist border regime exists there is constant oppression and violence. Od rušenja skvotiranih baraka (10.maj 2017) jasno se oseća rast nasilja, represije i progona od strane državnih organa. Pre predsedničkih izbora srpska policija se ponašala rezervisanije, bez jasnih naredbi, zato sada otvoreno upotrebljava silu. U protekle dve nedelje su vlasti tri puta organizovale nasilne policijske operacije i prisilno premestili ljude u zatvorski logor u Preševu. Taj logor se zvanično vodi kao prihvatni centar otvorenog tipa, ali zapravo je tamo oko 1000 ljudi (uključujući i porodice sa decom) zatvoreno, neki od njih već više od godinu dana. Izlaz i ulaz u logor je zabranjen, osim za limitirani broj osoba sa specijalnom dozvolom, koji ponekad mogu da izađu radi kupovine. Vlasti redovno “prazne“ logor, tako što deportuju ljude (ilegalno) za Makedoniju, a oni koji su uhvaćeni u begstvu se takođe kažnjavaju deportacijom. Prva operacija se desila u zvaničnom prihvatnom centru u Obrenovcu, blizu Beograda. 10. Juna, u 5 sati ujutro se pojavilo oko 50 pandura u kampu i prisilili su ljude ( 103 nasumično izabranih) da uđu u autobuse koji su bili organizovani za ovu operaciju. Oni koji su pružali otpor su pretučeni i verbalno vređani. Na pitanje gde ih vode, i da li će ih zatvoriti u Preševu nisu dobili odgovor. Ljudi su bili uterani u autobuse, nisu imali ni toliko vremena da pokupe svoje lične stvari, čak ni mobilne telefone. Tokom ove operacije familije i maloletnici su razdvojeni. 16. juna, u 4 ujutro je bila još jedna policijska operacija u drugom prihvatnom centru u Somboru. Ovoga puta su ljude okružile policijske jedinice uteravši ih u obruč. Slično kao u Obrenovcu oko 150 osoba je nasilno preveženo za Preševo. Treća operacija se desila 22. juna u blizini Šida, takođe u 4 ujutro. Policajci su doslovce pošli u lov na ljude koji su još spavali na otvorenom prostoru, gde su se skrivali pokušavajući da napuste Srbiju. Oko 100 ljudi je odvedeno u zatvorski logor u Preševu. Pretvaranje srpskih vlasti da su ove nasilne operacije bile sprovedene “bez primene sile, na ljudski način”, i da su spasili migrante od krijumčara, lokalce od migranata, a ostatak evrope od “ širenja izbegličke krize” , znači sve su spasili, više je nego degutantno. Sve dok rasistički režim granica postoji, nasilje i tlačenje je konstantno. Solidarno sa svim putnicima bez putnih isprava!